One of Shakespeare’s earliest and most popular comedies, The Taming of the Shrew delights with disguise, deception and devilment. Shakespeare gives us the improbable courtship of the fiery-tongued Katherine by the arrogant Petruchio. But unlike Shakespeare’s other ..
Houston, TX – The Classical Theatre Company (CTC) opens its inaugural 2008-2009 Season with Shylock, The Jew of Venice, an original adaptation of William Shakespeare’s The Merchant of Venice. 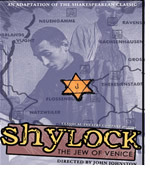 Adapted and directed by CTC Artistic Director John Johnston, Shylock makes its regional debut at.. Opens November 18 and runs Thursdays, Fridays, and Saturdays at 8:00 pm Thru December 11th and final show on the Friday December 17th at the Axiom Theater, 2524 McKinney.